Students that compete in the Olympic style-boxing event are given membership to a Southside boxing gym. Sixteen students took the stage to compete in the Olypmic style-boxing event hosted by the office of student life Oct. 11 in the mall. About 300 students signed up for the four-week training and 60 students showed up for practice. Focus, discipline and defense are the three components Ramos seeks when choosing students to compete in the Olympic style-boxing event. Ramos has been coaching the boxing team at this college for six years. “I try to make it fun and competitive,” Ramos said. The workouts consist of cardio, polymetric workouts and defense, such as blocking and bobbing. “The first week of training, I tell the students it’s going to be boring teaching the students their boxing stance,” Ramos said. “I was raised around boxing. My older brother was a boxer, and I would go to the gym with him and my dad,” Ramos said. The boxing program is an after-school activity for students. The program gets bigger every year, Ramos said. “The last six years I’ve been coaching this program, I have had five golden gloves champions who are all females,” Ramos said. For the fighters who competed in the Olympic style-boxing and still want to pursue fighting after the boxing program, they can work out at Ramos Boxing Gym at no charge. The boxing program uniforms have been used for seven years. “We try to get new uniforms, but they cut the budget every year,” Ramos said. Students who participate in the boxing program fundraise throughout the year by selling sausage wraps, chips or drinks. The funds they raise go toward sweaters and T-shirts for students who compete in the event, or the funds are spent on team-bonding meals. Business administration sophomore Adelita Vecera is a first-year participant in the boxing event. This year’s event had one female bout and the remaining seven were males. 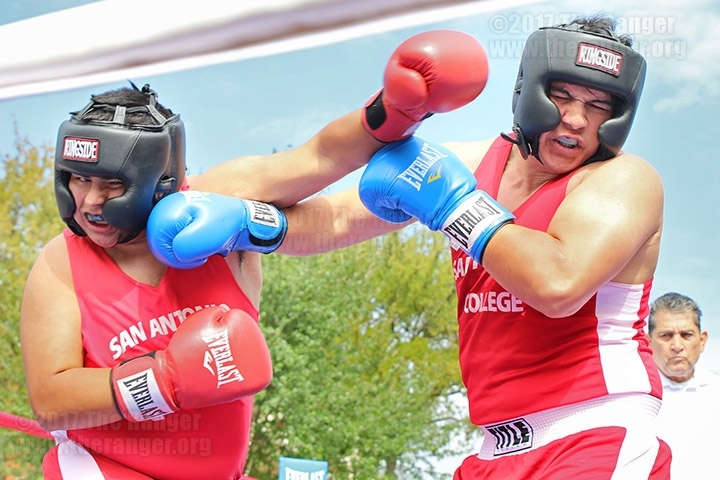 Biology pre-nursing freshman Carlos Lopez is a first-year student participating in the boxing event. Each fighter had three rounds with one minute of fighting in the ring. The cost to host the event totaled $4,050 dollars: $900 for the boxing ring rental, $350 for the on-site doctor, $1,600 for the sanctioned fight, and $1,200 for registration of the 16 fighters at $75 each. For more information on the boxing program, call student life at 210-486-0125.